Modified Arts is proud to present the dual, brand-new works of Chad Knapp and Jeff Falk, two eminent visions of how a sort of punk-rock aesthetic translates to the visual. Two veterans of the Phoenix art scene, the artists may differ in palate, but the stark energy in their work in indicative of a shared impulse. Falk has represented the city powerfully now for nearly four decades—producing first as an early regional devotee of the Dada school of anti-art. Honing his craft since then, the artist for 15 years was a member of the legendary MARS art collective, which helped launch the downtown Phoenix arts scene in the 1980s, and presented some of the most diverse and iconic work in the state, especially as part of its annual print show. Incorporating performance art and poetry into his practice, Falk similarly throws all media into his art objects, proudly smashing together assemblage, printmaking, painting, and photography alternately into each piece, while still maintaining an incredible unity. For this latest body of work, the artist continues to pursue creativity as salvation: wrangling his myriad ideas as a defense against the always-mounting injustices of the world into powerful works that make statements, yet remain emotive. Knapp’s trajectory perhaps resembles Falk of a few decades past—the artist describes his exhibit history as “mostly… places [that] are not around anymore” including the original Trunk Space, and numerous other DIY art haunts around the Valley. But that makes his work no less notable. Currently represented by Art One Gallery and teaching art in the Scottsdale Unified School District, Knapp draws objects and people in stark isolation. 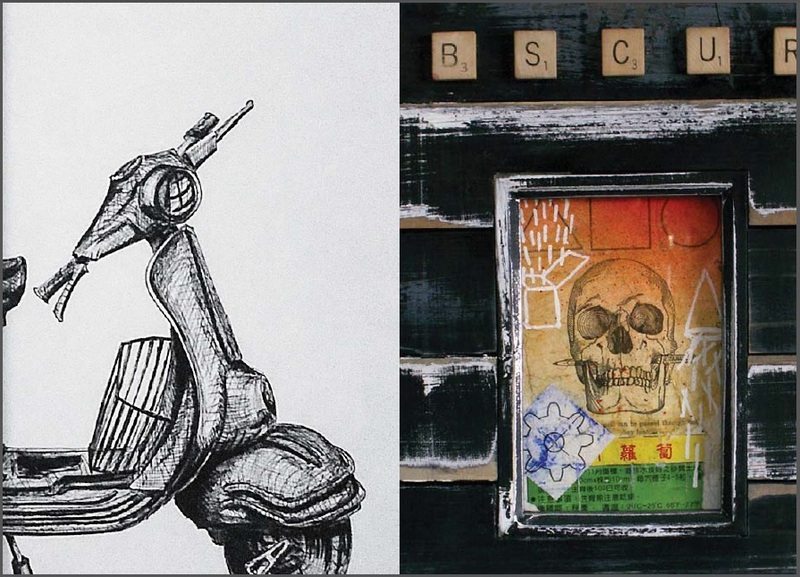 His pen-and-ink works strip ramshackle buildings, mod scooters, and weathered men and women, intentionally allowing the viewer to fill in the blank space with the environments they feel would fit the pictures best. High-contrast and rough, but sharp, the artist demands to be seen, hinting at his own punk, skate, and noise-inflected background. A sluggish summer group show this is not. With this duo exhibition, Modified Arts seeks to push out the energy of the Phoenix arts scene, as portrayed by two veterans with something distinct to show.